Stocks got off to a weak start for the year, as investors took a step back amid worries about slowing economic growth in China. 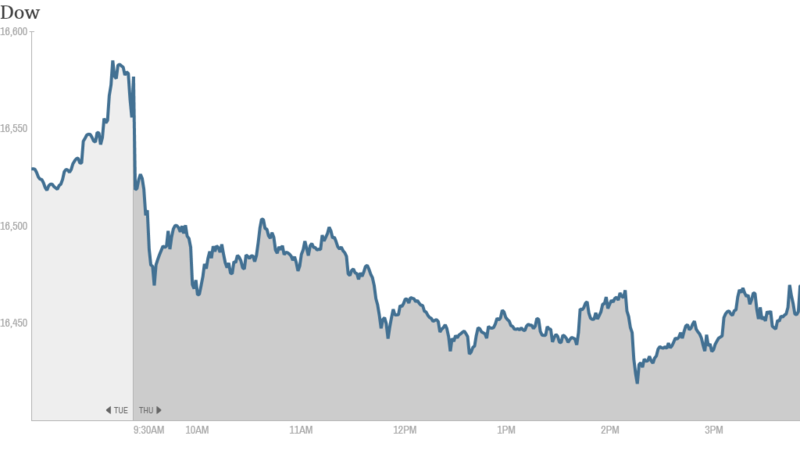 The Dow fell more than 130 points, or nearly 1%. The S&P 500 and Nasdaq also declined about 1%. This is the first time markets started the year on a down note since 2008. Investors were in a cautious mood after data showed that China's factories lost some momentum in December, adding to fears that the world's second-largest economy may soften in the new year. Economic data in the United States wasn't all that positive either. Manufacturing activity grew in December, but at a slightly slower pace than the previous month, according to the Institute for Supply Management's index. Initial jobless claims fell for a second straight week but came in slightly higher than expectations. Trading volume will likely remain light this week as many traders are still away for the holidays. On the corporate front, shares of Fiat (FIADF) jumped 16% in Milan after the Italian automaker announced Wednesday it was buying full control of Chrysler. A series of upgrades and downgrades from Wall Street analysts sent a number of big stocks moving. Shares of Apple (AAPL) slid after Wells Fargo downgraded the iPhone maker to "market-perform" from "outperform." Sprint (S) moved lower following a downgrade from Cowen & Co.
A downgrade from Jefferies sent shares Abercrombie & Fitch (ANF) lower, while an upgrade of Urban Outfitters (URBN) boosted that retailer's shares. Bank of America (BAC) shares gained ground after Citigroup analysts upgraded the stock to a "buy" from "neutral." Traders on StockTwits thought Bank of America's strong start to the year could mean good things for the financial sector in 2014. "$BAC Doors of reality waking up for some, as financials will be a huge winner in 14...Bullish," said traderrick1. "I'd like to know where all the people who said $BAC going out of business are now," said micmaher. "Stronger U.S. economy and steeper yield curve = profits. Bullish." While most stocks were lower Thursday, gold started off on a strong note, rising almost 2%. The precious metal fell 28% in 2013, marking the first down year for gold prices since 2000. As gold priced advanced, shares of Newmont Mining (NEM) and other gold miners surged, as well as the SPDR Gold ETF (GLD) and the Market Vectors Gold Miners ETF (GDX). StockTwits traders predicted that after a dismal 2013, this could be gold's year to shine. "2014 surprise will be $GDX and $GLD," said Lach14. "Starting today." StockTwits user hakihika said gold is one of his "favorite ideas for 2014." "Hated in 2013, lots claiming it'll go to $1,000," he added. "Outperform in 2014. Off to a good start. $GLD." 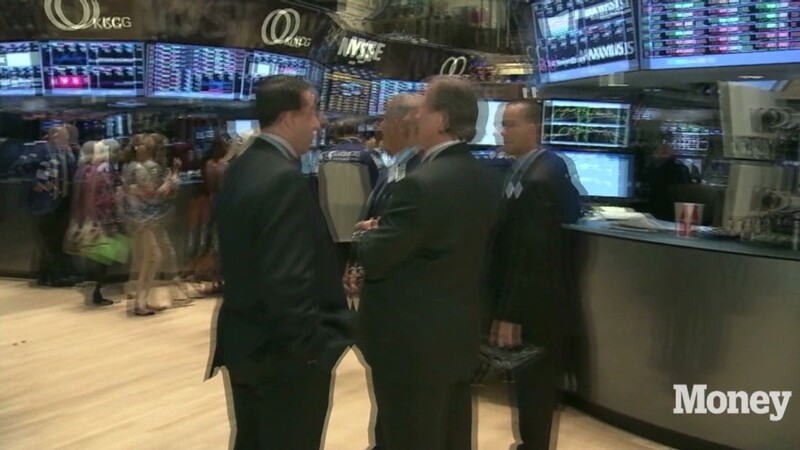 U.S. stocks finished higher Tuesday -- the final trading day of 2013 -- with the Dow and S&P closing out 2013 with record highs. The Dow ended the year with a 26% gain, while the S&P 500 jumped more than 29% and the Nasdaq surged nearly 40%. Markets were closed around the world Wednesday for the New Year's holiday. Related: Which world markets will be hot in 2014? European markets closed the first day of the year lower, with France's CAC 40 index and Germany's DAX declining by 1.6%. Most Asian markets ended the day with small gains. The Shanghai Composite index moved up nearly 1%. The Tokyo Stock Exchange was closed for an extended New Year break.